My time working with the RHS Media team has come to an end; it has been a pleasure to work with and get to know everyone in the office. Through this period I have experienced being a part of the editorial and digital teams and learnt plenty. 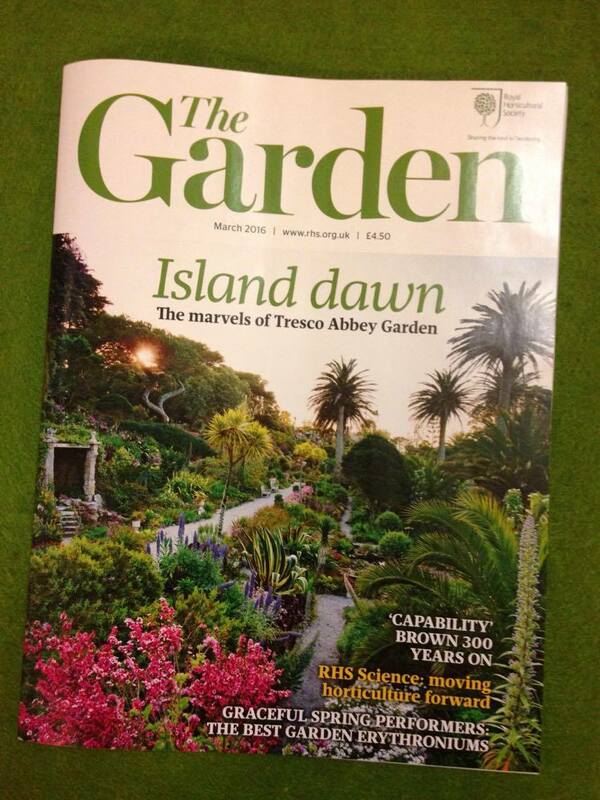 Editorial work involves the creation of various publications disseminated by the charity including regular magazines, The Garden, The Plantsman and The Orchid Review, and one-off Society publishing. 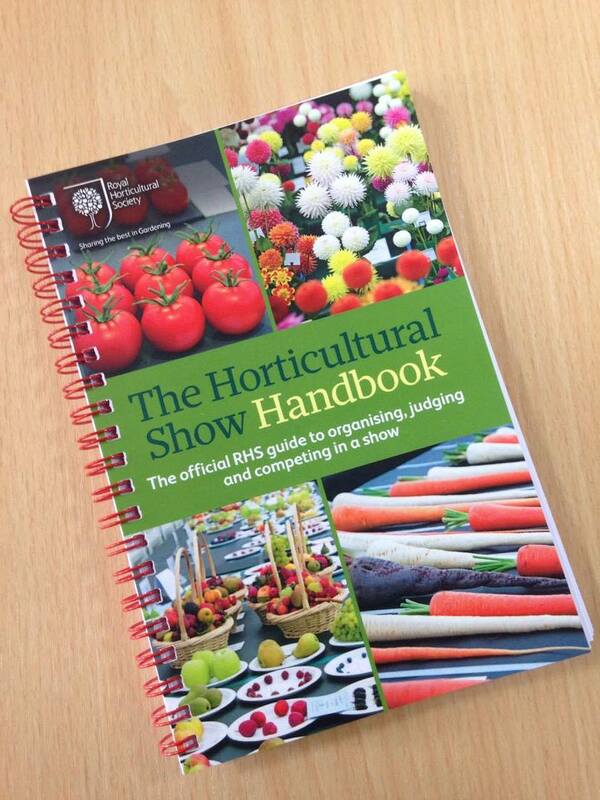 I have had the honour of contributing to the updated version of The Horticultural Show Handbook – the official RHS guide to organising, judging and competing in horticultural or gardening shows where fruit, vegetables and flowers are exhibited – and aided with proofreading and references within the upcoming monograph A Complete Guide to Kniphofia (working title). 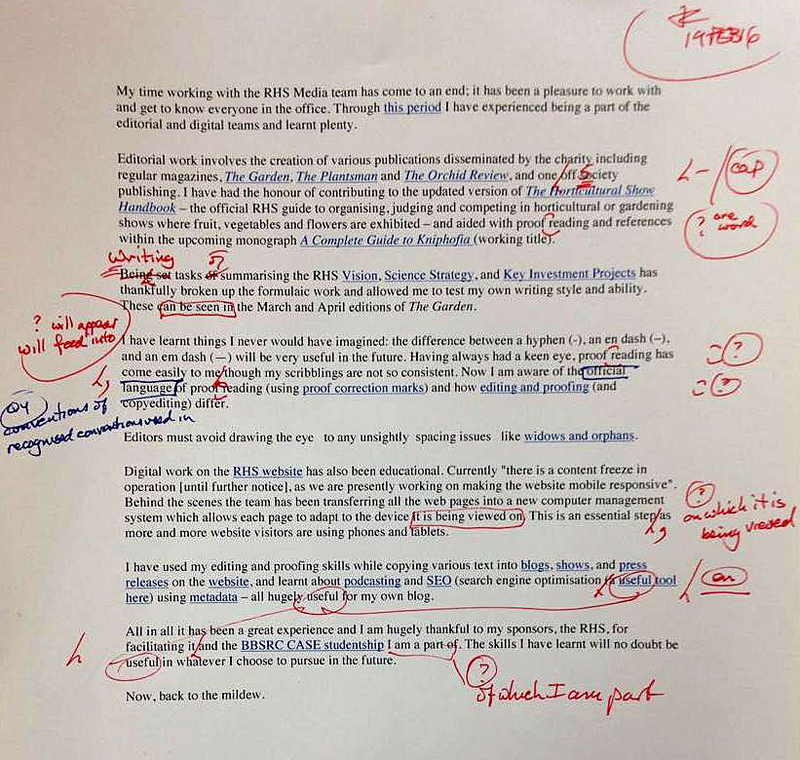 Writing tasks summarising the RHS Vision, Science Strategy, and Key Investment Projects has thankfully broken up the formulaic work and allowed me to test my own writing style and ability. These will feed into the March and April editions of The Garden. I have learnt things I never would have imagined: the difference between a hyphen (-), an en dash (–), and an em dash (—) will be very useful in the future. Having always had a keen eye, proofreading has come easily to me, though my scribblings are not so consistent. Now I am aware of the recognised convention in proof reading (using proof correction marks) and how editing and proofing (and copyediting) differ. Editors must avoid drawing the eye to any unsightly spacing issues like widows and orphans. Digital work on the RHS website has also been educational. Currently “there is a content freeze in operation [until further notice], as we are presently working on making the website mobile responsive”. Behind the scenes the team has been transferring all the web pages into a new computer management system which allows each page to adapt to the device on which it is being viewed. This is an essential step, as more and more website visitors are using phones and tablets. I have used my editing and proofing skills while copying various text into blogs, shows, and press releases on the website, and learnt about podcasting and SEO (search engine optimisation – a useful tool here) using metadata – all beneficial to my own blog. All in all it has been a great experience and I am hugely thankful to my sponsors, the RHS, for facilitating it and the BBSRC CASE studentship of which I am a part. The skills I have learnt will no doubt be valuable in whatever I choose to pursue in the future. Now, back to the mildew. PhD student at the University of Reading. Working on ID techniques of powdery mildew Fungi. Interested in mycology, plant pathology and arboriculture. This entry was posted in PhD research, Public Engagement with Science, RHS research, Uncategorized and tagged #PowderyM, Media, Oli Ellingham, Oliver Ellingham, Placement, RHS, Royal Horticultural Society, The Garden, The Orchid Review, The Plantsman. Bookmark the permalink.